There's your stats. We've got the most decorated player in the history of the game, who's overcome the best player of all time, his biggest rival throughout his career, a two time world champion and local opponent and a confident rising talent, against the current UK Open champion, who's come through several tough scraps against in form players who are all playing the best they've ever done. Will we have a fairy tale ending to Phil Taylor's career as he claims a sixteenth Matchplay crown to go with his sixteen world titles, or will Peter Wright put to bed the disappointment of choking away the Premier League and claim the first real big major of his career (as, while Wright will have been delighted with the UK Open, the Matchplay is much bigger and had both Michael van Gerwen and Phil Taylor play in it)? The current form points to Phil being a favourite, as the bookmakers suggest. The profile of his winning legs is incredibly similar to Wright's - there's just the two legs throughout the course of the tournament where Phil has finished in five turns as opposed to Wright's six, but there's a big advantage in the amount of pressure Phil's put on when the opponent has won his leg, over a six point difference. Over all data (my database stretches back to September), and not just this tournament, Phil still leads this category, but by a much smaller margin, 96.89 to 95.09. Wright is going to have to do a few things in order to pull this one off. Firstly, he's going to need to limit the amount of chances he gives Taylor to break, and force him to throw a twelve darter to get it. As the stats indicate, Phil will be there or there abouts in four visits if Wright doesn't kill in five turns, piling on the leg upon leg pressure is going to be critically important. He gave Daryl Gurney ten opportunities to break with a fifteen dart leg, Gurney only took five. You'd imagine Taylor will take more than that. Secondly, he's going to have to keep things close and then hope Phil doesn't turn it on when it matters. Against the two Dutchmen, Phil wasn't pressured at all - Adie kept things close through to midway through the fourth mini session last night, but Taylor, from 10-8 up, then put in a burst of five straight legs including three four turn kills - two of them breaks, to finish the game as a contest. Adie might have got the last of those to get a break back if it took place earlier, Phil only holding in six turns, but Lewis couldn't leave a finish after five of his turns. Finally, he's going to have to bag any cheap break chances that are offered up - if Phil doesn't check in five turns, he's going to have to be there to do so himself. Gurney only offered up the three chances to break in more than fifteen darts (two taken), I can't imagine Phil leaving any more than this. For Phil, he's going to have to keep doing what he has been doing, but realise that he's up against an opponent that won't buckle midway through a match - Wright isn't going to be afraid of him, and Wright has been able to take Phil down in big televised leg play events over the past couple of years - Phil couldn't get a win in the 2016 Premier League, losing one and drawing one, lost a decider in the World Series of Darts finals, lost the Grand Slam quarter final (in what's probably the best comparison, given that was a race to 16), and they split their Premier League games this year before Wright edged the semi final. Whether the pressure of this being a big major and a potential career defining victory (to date) for Wright will tell if it gets down to the wire is another question, and one Phil will have to ask. If he just keeps playing as he has been doing, I can't see that Wright will be able to accumulate a big enough lead where he can get close to the winning line and have a lot of room to play with - a situation where Wright needs one more leg with Taylor not even on double figures seems incredibly unlikely. I can't recommend any bets in this one, if I was going to bet it would be on Wright, but I can't see there being enough edge to start punting, so I'll call it a day for gambling on this one with a small 0.38 unit profit for the tournament. Even the handicaps for fun don't look that enticing, only being offered evens on Wright +2.5 if we were to think it will be as close as it could be (can't believe that some bookies are offering a Wright +1.5 market, as if you'd ever take the added edge of getting paid if Phil wins a sudden death leg). Note re: adjusted in the averages section for new readers - a turn is a turn. I don't give free bonus points if you finish in 13 darts as opposed to 15 darts. It's still five turns. Darts in this respect is like waiting for a bus - unless you're at a stop early enough to get the one before, you're still getting on the same bus. A thirteen darter against the throw is equally as worthless as a fifteen darter if the guy throwing first also finishes in five turns - unless you play well enough to finish in twelve darts instead, you're not getting the break. Hmm, no idea what happened there. Obviously the markets are loving the fact that Phil managed to beat Michael van Gerwen, and ignoring that Adie outperformed Phil tonight, smashing in five twelve darters for fun compared to Phil's three, that they both finished 12/16 legs in fifteen darts or less, and in both previous rounds he's played better. Shoving everyone's results into the master computer puts Adie at a 46% chance to bink the whole thing, yet he's a huge underdog on the market. 0.5u Lewis 11/5 v Taylor. Still mostly in shock to be able to analyse more deeply than that to be quite honest, but Adie's been playing incredibly, foot off the gas towards the end of the Norris game excepted. 1u Lewis 4/9 vs Norris, as stated in the previous post I think he's a substantial favourite vs Norris, the only worries are his back and how it will stand up over a long format as the quarter finals onwards are, but I would think that he should be dominant enough that it won't last too much longer than the Cross game and they should factor in breaks sensibly (i.e. not after 5, 10 and then cut away from the action if it's 10-10 and going to a tiebreak), I'd guess every five legs to the 20th, at which point I'd have guessed Lewis should be in the region of having 12-13 legs in the bank and not needing much more if they do play out from there. van Gerwen's 2/11, and I'm surprised he's that short against Phil, it's too short to consider a bet, Taylor may still have the game to get it to leg 20 even or no more than a couple of legs down and it could start getting twitchy, at least enough that I'll ignore the game. With nothing further to add in terms of the Matchplay at this stage, with all analysis done and all bets down, a couple of things popped into my mind recently that I wanted to mention briefly. With that in mind, if we're correct score betting on Anderson/Kist and Webster/Wade tonight, surely we want to be going 10-3 Anderson and 10-8 Webster (as examples, I've not looked back at my calculations to see the most likely winning points) if we think the favourite throws first more often? Perhaps something to have a look back at and see how much correlation there is between throwing first and winning scoreline. Also, an awful lot of my analysis has just covered winning legs, and while I've made reference to how players do in losing legs, and also compared the average difference between the two (check the post called consistency, at least that's what I think it's called), but not really tried to combine the two. This is something I should be able to do easily, I've got the number of visits and points scored for each circumstance already and weighting them to number of legs won and lost should be trivial, I'll look at this after the Matchplay is done I think. A wide open section of the draw featuring probably the weakest top 8 seed, one of the strongest non-top 8 seeds, a recent Pro Tour winner and a wildcard, first to look at is James Wade against Darren Webster. After a quarter final in the worlds, which is more or less what was expected, Wade has had a mediocre 2017 by his standards, having the best run of his season early on in the last UK Open qualifer, reaching the final with some good victories, following up with a semi/quarter Pro Tour weekend, but then drew Adrian Lewis straight off the bat in the UK Open and lost, and following that, there's not much to shout about apart from a couple of semi finals in April. Darren Webster had a big break through last weekend, winning on the Pro Tour for a first ranking title in a decade, to get a tournament win to go with the elite form he was showing late last year. Like Wade, he lost in the first money round of the UK Open in a surprise loss to Ronnie Baxter, and aside from the win mentioned, hasn't made as many runs past the last 16/last 32 as he'd have liked, and has had a fair number of hiccups in opening round losses to the likes of Tony Newell, Aden Kirk, Jamie Bain, Mike de Decker and Jimmy Hendriks. The other match in this section sees Michael Smith, a multiple time European Tour winner who's yet to reach a major final or get past the second round at Blackpool, against Steve West, a player on debut looking to push up into the top 32. Smith managed the first win in a while after a real bad 2016, taking the title in Gibraltar to climb back into the top 10 in the world, and has added a few other very solid results - reaching a European final and semi final in successive weeks, his form in Europe being such that he's likely to be a top 4 seed for the European Championship, and has been clocking up a good selection of quarter final or better returns in general. West has done little this season, outside of a couple of Pro Tour semi finals. He's here mostly on account of his form in late 2016, where he made a final just in time to qualify for the Grand Prix. This year, he's had six first round exits in Players Championship events, and didn't get a single cash in qualifying for the UK Open. He's doing well enough that he should be absolutely fine for making the majors outside of the European Championship, so maybe I'm being harsh, but it's certainly not been as good this season as parts of last. In round two, Smith should be a favourite, against either opponent, but not by as much as he is here, there's a bit of variance but still should be 60% or better against both Wade and Webster. If West did pull off the upset, he'd clearly be a dog again in round two, with less than a 30% chance against either opponent. Peter Wright managed to secure a first major title this year with an impressive victory in the UK Open, nearly added the Premier League, and will be very much looking to add to that tally with what looks to be a favourable draw through to the semi finals. Wright's managed to win seven ranking titles this season, but outside of the wins there's been some questionable results - a loss to Kim Viljanen in Austria, a loss to Wayne Jones in round 1 on the floor, some moderately early exits to players he'd expect to beat elsewhere such as Paul Rowley, Paul Nicholson, Christian Kist and Vincent van der Voort. Wilson's had a really poor season and made it here as the twelfth Pro Tour qualifier, a quarter final in Gibraltar and a semi final in Milton Keynes being enough to make him safe, but most of his ranking money came from the run up to last season's Grand Prix, where he made almost half of his money in the rolling Order of Merit in August/September. Aside from those two scores this season, which happened within a week of each other, he's not even reached the last 16 of an event. He only just qualified for the UK Open and didn't cash, while he's done well in European qualification he's lost in the first or second round, only beating Lee Bryant outside of the Gibraltar run. Wright is a big favourite here like the other top three seeds, but unlike them he's actually a prohibitive favourite - only getting to 89% win chances, which isn't enough at 1/10. He's a much better player than Wilson, the big difference being the number of legs won in fifteen darts, which Wright does in 70% of legs to Wilson's 50%, which is a level of consistency that Wilson will find hard to combat, given his twelve dart percentage is down in the single digits. Over a race to ten I can't see a winning path for Wilson, at least not often enough to even think about backing the underdog in this one. A very close first round matchup looking at all the stats above, while there's a big difference in the official rankings, everything else is fairly close apart from Reyes doing a lot better when losing legs, a full six points higher than Thornton, but as we all know, Thornton is very hot and cold, so we can expect this. Robert has had some decent runs on tour since a real mullering by Joe Cullen in the first money round of the UK Open, making a semi final and a quarter final in one weekend at Wigan in June, and also making a run to the final at the same venue in April, results that were just enough to keep him in the seedings. On the other end, he's now needing to qualify for Europe and has only hit twice out of nine attempts, and has first round losses on tour to Richie Corner, Paul Rowley and Steve Lennon. Reyes makes his debut here, and the bookies rate him as a small favourite. Now doing well enough on tour to be seeded for quite a few of the European Tour events, where he's been able to make some of his best runs since joining the PDC, with two semi finals in June. While he's not been able to get that far this season on the Pro Tour, he has an incredible number of last sixteen and last 32 performances, grinding out £1000 or £1500 each time, and in other European events he only slipped once as a seed to Ulf Ceder, picking up three grand on another four occasions. Thornton is a slightly more explosive player, but Reyes isn't too far behind in terms of twelve dart percentage, only 2-3 percentage points, while Reyes is five points ahead in fifteen dart percentage, and a similar level in eighteen dart percentage. What he's doing when losing was mentioned earlier. Reyes can close to match Thornton in his only real advantage and is a lot more consistent everywhere else, and while Thornton's come into a little bit of form, Reyes is also in form and has gained a lot more confidence on stage. This is more like a 60/40 game than the coinflip the bookies suggest, so 1u Reyes 10/11. 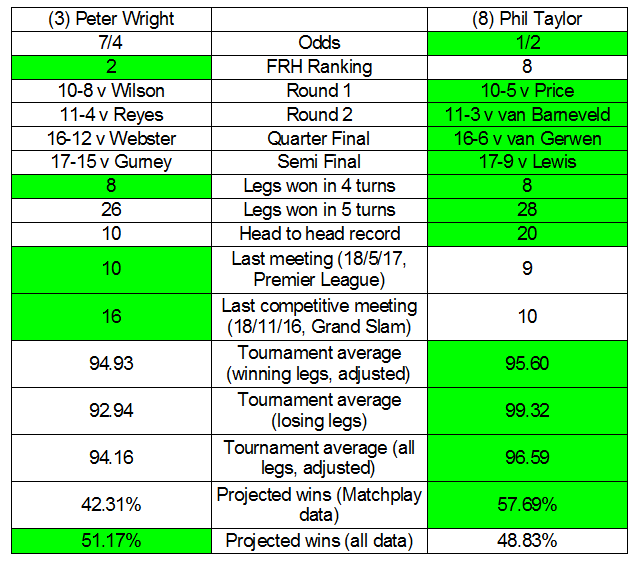 In round 2, Wright should be around a 3-1 favourite against either opponent, both times projecting in the 70's for win percentage (the high end vs Thornton, the low end vs Reyes), so if Wright is as short relatively in round 2 as round 1, then particularly there may be chances for a Reyes bet. If Wilson pulls off the shock, he should be live against Thornton, but would still need 2/1 to bet on him, while against Reyes he'd be outmatched - Reyes projecting to be a 75% favourite.